As smartphone adoption increases and mobile technology becomes more powerful, it’s changing the way in which people interact with health information. The popularity of health and medical apps has begun to explode, and the amount of health data along with it, much of it thanks to those increasingly wearable and user-friendly gizmos that use smart sensors to capture and transmit all shades of biometric data. Smartphones now tap into these health devices, turning our phones into heart monitors and cancer screeners, all with the goal of helping us live longer, healthier lives. You may not be familiar with them by name, but Azumio is one of a number of young startups tapping into this hot trend, leveraging smart mobile technology to get us making better and more informed health decisions. Thanks to the popularity of its biofeedback apps like Instant Heart Rate, Azumio has attracted 20 million downloads of its iOS and Android apps in less than two years. And today, the Palo Alto-based company is adding to that total and beginning to round out its product set by scooping up SkyHealth, the creators of Fitness Buddy, the top-ranked paid health app on iTunes. While the terms of the acquisition were not disclosed, the eight-old SkyHealth has seen 5 million downloads thanks largely to Fitness Buddy and Glucose Buddy, its $1 fitness and diabetes trackers. As a result of this and the fact that SkyHealth was one of the early movers in health development for iOS, the startup has been able to bootstrap its way to profitability. Azumio, on the other hand, chose to go the venture route, raising $2.5 million from Founders Fund, Accel and Felicis (to name a few) last year. The founders tell us that the deal was a combination of cash and equity, and we’ve been able to learn from other sources that in fact the deal leaned more towards equity, as this war more of an acqui-hire, with SkyHealth founder and CEO Tom Xu joining Azumio as a partner and head of product development, along with the startup’s three main developers. For Azumio, the acquisition more than doubles its product portfolio, bringing SkyHealth’s 15 health and fitness apps to its platform, while SkyHealth now has access to a larger audience and more resources as part of the Azumio team. But, really, both teams said that they share a similar vision, and joining forces gives them a better shot at making that happen. The team wants to create a mobile health and fitness platform that gives users a complete profile of their health, using each piece in the team’s collective product suite. In the next few weeks, the team (now at 13 people) plans to launch a fitness dashboard, which will take readings for each of their applications in an effort to give users a more complete report on their health. 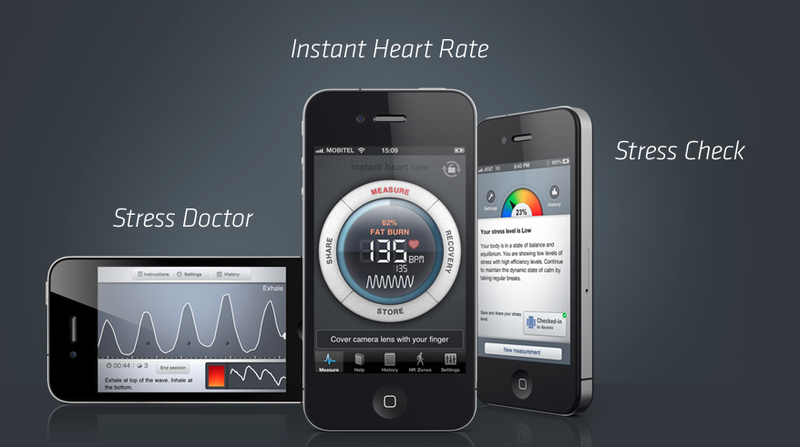 With SkyHealth’s additions, Azumio’s apps now span heart, stress, and sleep monitoring to fitness and glucose tracking. If Azumio opens that dashboard up to aggregate data from other health devices and apps as well, it could really be a game changer. For more, find Azumio here.